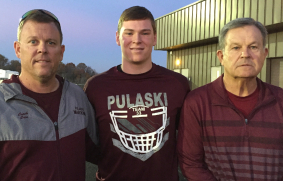 Pulaski County senior Wiley Cain, center, flanked by his dad, Johnny, and grandfather John before last Friday’s playoff game against Southwestern. Wiley Cain believes he was destined to be a quarterback, that it’s in his DNA to play the most demanding position in football (and maybe in all of sports), and to follow in the footsteps of his grandfather and father. His granddad, John Wiley Cain, was a star high school quarterback for Cumberland in the early 1960s. His dad, John Wiley Cain II, was a star high school quarterback for Somerset in the late 1980s. Wiley Robert Cain, a senior at Pulaski County, is a third-generation QB, but the football he plays is a whole ‘nother game. When John Cain quarterbacked Cumberland almost 60 years ago, he didn’t pass much. “I don’t remember throwing it more than 10 times a game very often,” he said. When Johnny Cain quarterbacked Somerset in the late 1980s (and his dad was the Briar Jumpers coach), he didn’t air it out much either. Wiley, on the other hand, is dropping back and flinging it all over the field for Pulaski County. 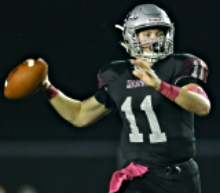 Going into Friday night’s Class 5A semifinals against defending champion Covington Catholic, he’s averaging 36 passes a game in his three years as a starter. He has 308 completions this season. Only three other QBs in state history are in that 300 club. He holds school records for most pass attempts (52) and completions (38) in a game. For his career, Wiley has completed 741 of 1,203 passes for 8,829 yards and 83 touchdowns, despite missing seven games due to injuries. “He throws the ball better than I ever dreamed about throwing it,” his granddad said. “I look at those numbers and I can’t process them,” his dad said. His dad and granddad have been major influences, of course. Johnny Cain coached his son through middle school, and they still talk a lot of football. But it’s tough on Johnny watching instead of coaching. “I think it’s easier being in control of what’s going on like dad was with me, calling the shots as the coach, rather than having to sit on my hands in the stands and keep my mouth shut,” he said. In the Cain family, there’s never a time when football can’t be discussed, as Wiley will attest. “We were sitting in church (Sunday), and it was the part of the service where it’s the exchanging of peace, and granddaddy was talking to me about how he’s happy that I’ve been working on my footwork,” he said with a laugh. No matter how good his footwork, a quarterback is going to get hit and he’s going to get hurt. Johnny said when he played for his dad, “you kinda rubbed dirt on an injury” and kept playing. Wiley has that same toughness. When he was a sophomore he suffered a broken collarbone in the first game of the season but returned to action six weeks later. When he was a junior he suffered a torn labrum in his throwing shoulder in the ninth game of the season against arch-rival Southwestern. Incredibly, he was injured in the second quarter but kept on playing and wound up setting a school-record with 52 pass attempts. Wiley said he never thought about calling it quits. While quarterback is the most glamorous position in football, Wiley realizes his success is not a solo effort. “If everyone else on the team doesn’t do their job, it doesn’t matter how good the quarterback is, it’s not going to turn out well,” he said. Pulaski County’s receiving corps, including Jake Sloan, Grant Oakes, Jacob Shepherd and Ian Ware, perfectly complements his passing. Sloan has 109 catches this season, the second most in state history. Pulaski County’s Jake Johnson set the record of 139 two years ago when Wiley was getting him the ball most of the time. When Johnny Cain was Somerset’s quarterback, he was doing what came naturally. Not only had his dad played the position, his first cousin, Ronnie Cain, had quarterbacked Somerset to the state finals in 1978. Johnny Cain helped Somerset reach the state finals in 1988, one of four times the Briar Jumpers were state runners-up in John Cain’s coaching tenure. Now Wiley has a chance to reach that big stage, too. If Pulaski County upsets CovCath Friday night, it will advance to the state finals at UK’s Kroger Field. Win or lose, it won’t be the last time he’ll be taking snaps. Wiley intends to play football somewhere at the next level. Having scored a 34 on the ACT, he’s got the academic credentials that make him attractive to smaller schools like Centre College, and he’s got the size (6-foot-2, 215) and skills to make it at bigger schools. “I’ve had the dream to play college football my entire life,” he said. Playing quarterback was never a dream. Playing quarterback was always a given. After all, he is a Cain.